Below is a complete list of the facilities available to Music & Theatre. A theatre technology lab open to ISU students. Contains ten 27" iMacs. Carver 308 is the space used for the performance based Theatre classes including The Actor’s Voice; Acting I, II, and III; Musical Theatre I and II; and Directing I and II. The room is also sees regular use as rehearsal space for ISU Theatre productions. This space is available to students when it is not in use for classes or ISU Music & Theatre rehearsals and can be reserved by check-out in the Theatre office located in 310 Carver. You may also email lsulz@iastate.edu to reserve space. To check availability, please see the calendar here. The room is equipped with A/V equipment, two scene and computerized lighting control, light board, and dance mirrors. Carver 308 is the Theatre classroom that is used for classes including Introduction to Technical Production, Stagecraft, and Advanced Design classes. The design studio has twenty drafting tables plus space for craft work, as well as individual locker space for student projects. The room is equipped for both wired and wireless Internet. No member of the audience is more than 13 rows from the speaker in the uniquely designed 451-seat Fisher Theater. The building also features a media booth and full lighting capabilities. It is a perfect setting for intimate performances. 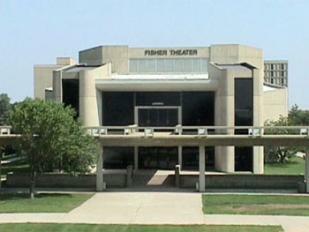 ISU Music & Theatre’s scene and costume shops are located in Fisher Theatre and occupy over 3,600 square feet. There, ISU students perform all scenic and costume construction for theatre’s six show season. 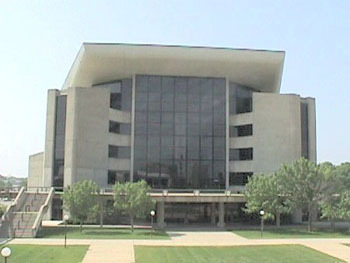 The music building, opened in 1980, is an exemplary music facility, recognized for its excellent acoustical design. There are rooms for large ensemble rehearsals, small ensemble rehearsals, a percussion practice room, an instrument repair facility, practice rooms containing pianos, and an outstanding recital hall. Large instruments and lockers for instrument storage are available for rental to students performing in ensembles. Many large ensemble concerts take place in either the Martha-Ellen Tye Recital Hall or the internationally acclaimed Stephens Auditorium. The Music Department houses and maintains an electronic music studio which features a wide range of analog and digital sound synthesis and recording equipment which may be used by students who enroll in composition studies. Additionally there is a computer lab with MIDI and digital audio workstations. The music building is equipped with over sixty pianos, including twenty-two Steinway grands. A practice wing on the ground floor has grand pianos which are reserved for piano majors and advanced piano students. Beginning and intermediate students study group piano in a modern electronic piano lab. In addition to three practice organs, including two by Lynn Dobson of Lake City, Iowa, there is a three-manual pipe organ built by John Brombaugh in the Recital Hall. The newly-renovated Stanton Memorial Carillon is a well-loved ISU symbol. A practice clavier, similar to the carillon, is located in the Music Hall. Smoking is not permitted in the music building or on campus. Consumption of food or beverages is not permitted in the practice rooms, practice modules, recital hall, computer lab, classrooms, or rehearsal halls. Student groups will be permitted to sell food and/or beverages in these areas. The specific plans for such sales must be approved by the Department Head. Music majors, with faculty approval, may reserve use of rehearsal and locked classrooms. If the faculty member is not available to unlock/lock the room, they may request that students be allowed to check out a key from the Main Office. Music students who have received such approval may check out a key by leaving an ID. The Recital Hall has a sophisticated multi-media system. Music department student organizations may request use of the system for special music events with the permission of their faculty adviser and the Department Head. The faculty advisor is responsible for the security of the Recital Hall and the proper operation of the multi-media system. The faculty adviser must supervise the entire event in person and operate the multi-media system. Students will not be issued keys to operate the multi-media system. A limited number of wind and string instruments for use in university ensembles and classes are available. Instruments are issued in Room 216B. Hours of checkout are posted on the instrumental bulletin board. An instrument rental fee is charged to the student's university account. Students assume full responsibility for care and security of the instruments. Lockers are for student convenience and the department cannot accept responsibility for the contents. The department's computer lab (room 52-56) is open during the academic year. A schedule of open hours will be posted at the beginning of each semester. Open hours will depend on funding and student worker availability. The computer lab is funded largely through student computer fees and complies with LAS Computer Advisory Committee (LASCAC) requirements. MIDI work stations with various music software programs are available for student class use. Suggestions and/or questions regarding the computer lab should be directed to Chad Jacobsen. When classes are not in session, the building is usually open weekdays from 7:00 am - 5:00 pm For complete information about hours when classes are not in session, check with the Main Office. Students wishing reserved times may sign up in the Department Office beginning the first day of classes each semester. A schedule sheet of reservations is posted on each practice room at the beginning of the semester. Reserved rooms are relinquished if not occupied within 15 minutes of the reserved time. Grand piano practice rooms are locked. Piano majors and other students with permission from the piano faculty may be issued a key for these practice rooms. Use of the carillon, harpsichord, or organ practice rooms and issuance of keys for those rooms requires permission of the instructors. Larry Curry will issue key cards upon approval of appropriate instructors. 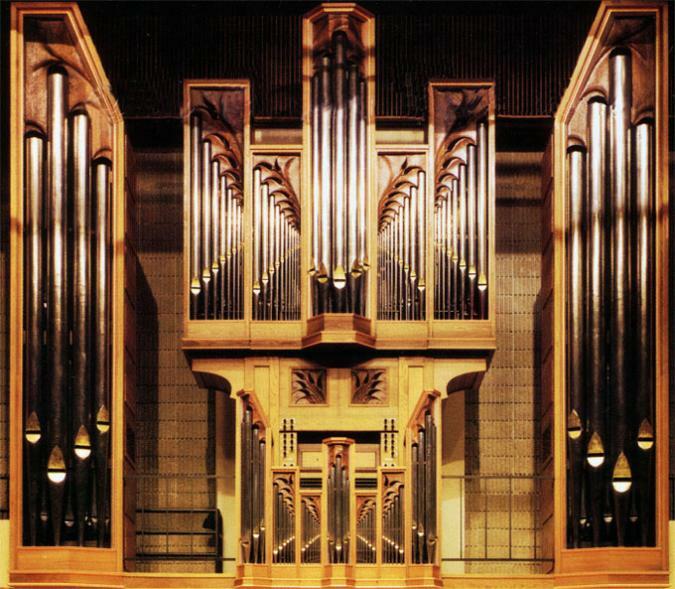 The department owns four pipe organs: a seven-stop, two-manual tracker-action instrument by Wolff of Quebec and two two-manual mechanical action organs by Lynn Dobson of Lake City, Iowa, one of three stops and one of seventeen stops. A large three-manual tracker organ of John Brombaugh, situated in the Recital Hall, is available to experienced organ students for lessons, accompanying, and performances. A harpsichord is available: a large two-manual instrument by William Dowd. These instruments are available for departmental events provided that the performer is a qualified organist/harpsichordist and that permission has been obtained. Students should contact the music office for information. Go to the Carillon homepage. A carillon practice console is located in Music Hall (Room 047) for the use of carillon students only. Reservations should be arranged well in advance. The Concert Coordinator makes all reservations for performing facilities and maintains a current calendar of events. This calendar should be checked before selecting any dates. Note: music department students and faculty have first priority for booking rehearsals and performances. The facility normally scheduled for music student performances is the Martha-Ellen Tye Recital Hall. Other rooms, including Music Hall 102 and 130 or rooms in Memorial Union, may also be used. Music majors desiring the use of an auditorium for recitals and rehearsals for recitals must consult their applied instructors for permission and appropriate dates. It is the responsibility of the music student to have these dates properly recorded by the Concert Coordinator. Any proposed cancellation or change in schedule must be (1) discussed with and approved by the student's applied instructor, and (2) reported immediately to the Concert Coordinator for final clearance. 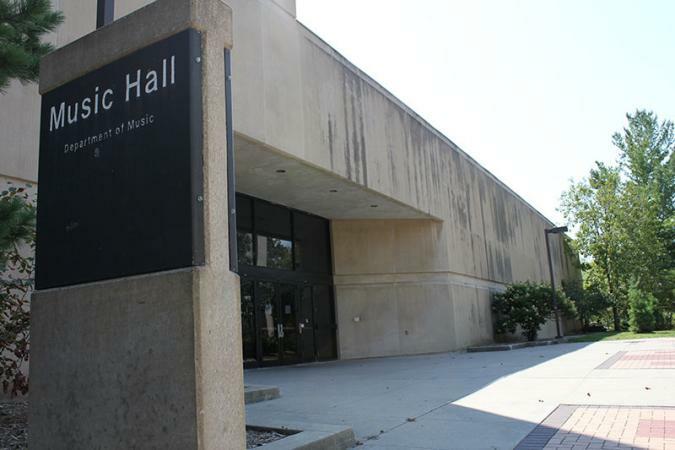 Use of the Martha-Ellen Tye Recital Hall for concerts and other outside events requires submission of the Music Facilities Request form available in the main office and permission of the department head. Because of the number of sensitive and costly instruments and equipment in the hall, under no circumstances will outside users be given keys to the Hall without authorized staff present. Facility Rental and Labor fees are charged for any event that is not sponsored by the Department of Music. The Martha-Ellen Tye Recital Hall is considered one of the premier acoustic environments in the mid-west. The recital hall auditorium has 305 seats and has seating onstage for approximately 75 musicians. All Martha-Ellen Tye Recital Hall facility requests require approval by the Department of Music & Theatre Chair. Contact the Department of Music at 515-294-3831 to determine available dates. Secure permission from the Music Hall Facilities Manager Larry Curry . Submit the Music Facilities Request Form available online or in the Main Office. Complete and sign the rental agreement form and pay a rental deposit equal to ½ of your program’s rental fee a minimum of 3 weeks in advance of the program. In the event of program cancellation, your account will be charged a $50.00 reservation cancellation fee for the hall. ISU Music Department ensembles, faculty and students have first priority for booking of rehearsal and performance time periods. The Hall may be reserved for a time period of up to 6 hours for the base fee. Physical move-in, set-up, the event itself, move-out, must all be completed during that block of time. No rehearsal time will be booked for outside events. One house manager, one stage manager and one usher are the minimum number of ISU music department staff required for any event. Additionally, any group using a Department of Music piano on stage will be charged a tuning fee. The fees for labor and piano tuning are in addition to the base rental. Outside users will not be given keys to the Hall or allowed time in the Hall without authorized staff present. The recital hall organ is only available for use by outside organizations if it is played by a member of the music department organ staff. There would be a separate fee to be negotiated with the performing faculty artist in addition to the base rental. Smoking and use of alcohol is prohibited. Selling any merchandise, food, beverage, or other product is strictly prohibited. Hall use fees are for blocks of time up to 6 hours. Blocks of time from 6-9 hours will be charged 170% of the Hall use fee. Labor fees are charged for any event that is not sponsored by the Department of Music. Labor fees are $20.00 an hour for each stage manager or house manager and $20.00 an hour for each usher or other additional staff person needed. There is a minimum two hour call for the above support staff. Programs require a minimum staff of one house manager and two stage managers to be scheduled. Audio or video recording costs of programs require a separate contract and fee for the Music Department recording studio. Only music department recording studio staff may use the music department recording studio equipment. A Recording Request Form is available online or in the Main Office if you wish recording services. Typical minimum cost for audio and/or video recording a 1 hour program would be $125.00. Inquiries or requests regarding our facilities should be directed to Larry Curry. The 2,747-seat theater provides meeting planners with a striking environment for lectures, meetings and performances. The main floor seats 1,704 attendees. There are 2,747-permanent seats, seating for 1,704 on the main floor, 26 wheelchair spaces, and 112 portable orchestra seats. Excellent acoustics; spacious lobbies; loading dock; mobility-impaired access; truck and bus parking; proscenium stage with full curtain; five dressing rooms on stage level; two chorus dressing rooms; two orchestra rooms; carpenter shop. Full theatrical lighting; two xenon spotlights; grand pianos; 125 orchestra chairs; 3′ x 8′ and 4′ x 8′ risers; sound amplifiers and console; microphones; monitors; cable; 55 sets of counterweighted lines; dance floor; orchestra shell.